The Global Fund to Fight AIDS, Tuberculosis and Malaria has announced Peter Sands — a former British banker — as its new executive director. The move comes after a delayed and restarted selection process involving controversy and conflicts of interest amongst numerous candidates. The selection process has been delayed since February, during which the search for a new Executive Director was restarted. One of the leading candidates before the second search beginning in February, Dr Muhammad Ali Pate, was marred in controversy after reposting on Twitter an article from the New York Times entitled “Being honest about Trump”. The article itself labelled the US President Donald Trump a fascist. To make Dr Pate the Executive Director after this could have been a catastrophic move for the organisation, potentially putting them at odds with their largest donor. This was not the only denunciation of President Trump to come from Dr Pate. As a Muslim, he was highly critical of Trump’s proposals for a travel ban from Muslim countries. Following Trump’s traditions during both his campaign and presidency, many of these criticisms were highly public on Twitter. Dr Pate was also found to have been part of a health agency accused of misusing funds. Noted within a report however was that Pate was not personally involved in this, even putting in place anti-corruption measures, which were reportedly not followed after his departure. Pate was an otherwise promising candidate, holding many positions within the government of Nigeria as well as being a former World Bank health specialist. Another finalist of the first selection process — Subhanu Saxena — was a former chief executive of Cipla, an Indian drug company that is one of the Global Fund’s largest suppliers. This however was deemed to create a conflict of interests, as Saxena previously profited from the investments of the Global Fund. The final frontrunner of the original search was Helen Clark, a former prime minister of New Zealand who ran the United Nations Development Program from 2009 to this year. Her nomination was deemed to be risky, as President Trump had expressed hostility for a number of United Nations programmes. Trump’s voter base, the US conservatives are typically critical of the United Nations family planning services, and so anyone linked to this was likely to create tensions amongst the Trump administration. The frontrunners in the second selection process may therefore have been considered “safer” choices, with less likelihood of any conflict with the United States. Peter Sands was not without press speculation and controversial decisions. Only a few days before the final decision was made he exited the campaign, citing “personal reasons”. Days later Sands contacted the Global Fund board requesting that they reconsider his candidacy as he wished to once more enter the race. The move to allow Sands back into the selection has been criticised by some as an indication of a lack of transparency within the selection process. Sands’s rivals seemed far more traditional choices for the role. Simon Bland of Joint United Nations Programme on HIV and AIDS; Frannie Leautier, formerly of the African Development Bank; and Anil Soni of the global pharmaceutical company Mylan. Each of the candidates’ main focus is within the field of global health, either deriving from pharmaceutical companies or previous roles within aid organisations. The decision to nominate Sands to the post may be an indication of the direction the Global Fund wishes to take. Or, it may j just be a sign of the times the organisation functions in. Tensions with the Trump administration have been a key consideration during the process, with the Global Fund keen on keeping its biggest donor happy. Tightening budgets amongst many of the Fund’s major donor countries in recent years have seen the Global Fund struggling with keeping its finances in order. In order to alleviate these issues, the selection of a banker whose intention is to make the Fund more cost efficient is a reasonable choice. 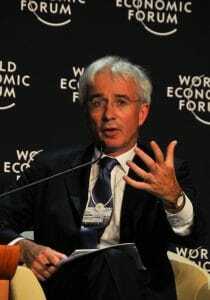 Peter Sands was a former chief executive of Standard Chartered Bank. Sands was noted as being highly successful within Standard Chartered, even increasing its share price during the 2008 recession at a time when many other banks saw severe losses. Before joining Standard Chartered, Sands attended Oxford University. This was followed by a degree in public administration from Harvard. Sands then worked in Britain’s foreign office and as a McKinsey & Co. management consultant. His record in finances is extensive so many expect that he will be a good choice in making the Global Fund a financially appealing, and cost effective aid investment. Sands’ experience, while primarily in banking, also extends to aid organisations and health research. He is the chairman of the World Bank’s International Working Group on Financing Pandemic Preparedness. He is also a research fellow at the Harvard Global Health Institute and the Harvard Kennedy School of Government. There does however exist a possibility that tensions may still exist between Sands in his new role and the Trump administration. Sands has so far received commendation from both the global fund, as well as a number of partner organisations for his success. “Peter Sands brings exceptional management and finance experience…At a time when we face complex challenges, his ability to mobilize resources while managing transformational change is exactly what we need. We expect him to take the Global Fund to the next level.” said Aida Kurtović, the chair of the Global Fund board. An issue that is likely to recur across Sands’s time as Executive Director is antibiotic resistance. This is an issue that is occurring with both HIV and tuberculosis, with strains of the parasite that causes malaria that are increasingly resistant to antimalarial treatments also now being found across Africa. Sands has already made statements acknowledging that in order to address the situation of increasingly prevalent antibiotic resistance — as well as continue to reduce deaths associated with the disease the Global Fund aims to prevent — proper financing will be important. “I’m not pretending I’m a clinician or an epidemiologist. But my expertise in economics, finance, and management I think is very relevant to the challenges that the Global Fund faces in the next phase of its development” said Sands in a statement following his admission to the role. His success in the role of guiding the Global Fund may be vital over the coming years. International aid is currently facing a turbulent few years. Trump is consistently attempting to reduce foreign aid donations. Groups such as the African Leaders Malaria Alliance (ALMA) — who work closely with the Global Fund — have responded well to the nomination of Peter Sands. The Executive Secretary of ALMA Joy Phumaphi said, “On behalf of the African Leaders Malaria Alliance, I congratulate Peter Sands…we look forward to working closely with Mr Sands, to ensure a coordinated and collaborative response and achieve a malaria-free Africa,”. Effective collaboration with local groups within beneficiary countries will be hugely important in ensuring successful use of Global Fund finances.